Students will discover what it’s really like to work as a member of a consultancy group in a variety of different sectors, including international relations, finance, design, law, and communication. IE University’s Labs offer students the opportunity to work on real-world projects for international clients. Students will discover what it’s really like to work as a member of a consultancy group in a variety of different sectors, including international relations, finance, design, law, and communication. D-Lab (Design Lab): This lab takes an integrated approach to the world of design and architecture. Students will be working on a diverse selection of architectural projects, as well as city planning initiatives alongside local tourism authorities. Finance Lab: Designed for students who want to work in the world of finance, this lab focuses on analyzing financial markets and assisting consultancy groups with a range of tasks. Legal Clinic (Laws Lab): Students who participate in this lab will offer legal advice to non-profit organizations and institutions that are in need of legal consultation. Several international law firms also collaborate with the Legal Clinic to conduct research and consultancy processes. Sports Lab: This lab works on issues related to individual players, teams, and coaching in the sports industry. 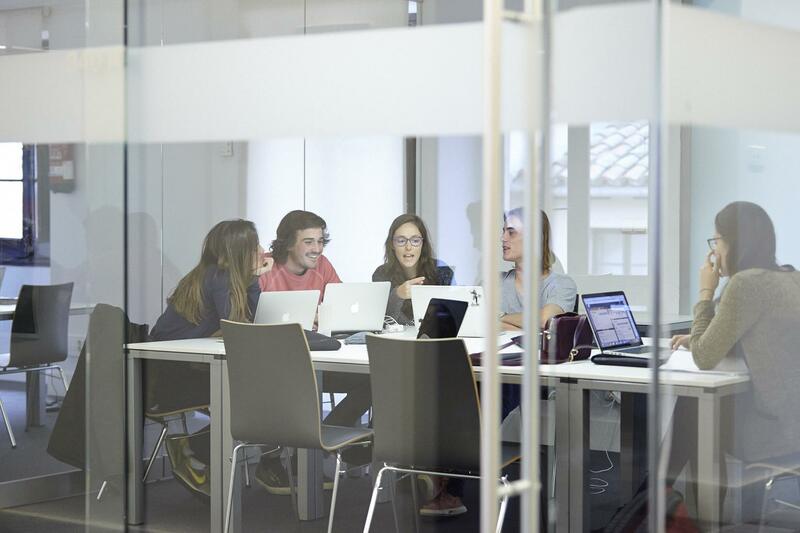 Students participating in this lab will work on consultancy projects for different Spanish and European football clubs, and Formula 1 racing, to name a few. Communication Lab: The Communication Lab works with a range of organizations and companies with communication and media needs. Students who participate in this lab create content strategies on different platforms according to the client’s profile. Start-Up Lab: The Start-Up Lab is, in essence, an incubator for young entrepreneurs looking to develop their ideas and business plans. Students will receive advice from professors and successful entrepreneurs to help them launch their own projects. Marketing Lab: In this lab, students are involved in creating brand-building initiatives and marketing strategies. Participants also work on market research and consumer insight studies for a wide variety of companies in different sectors. IR Lab: In this lab, students execute professional projects of international dimensions for both private companies and non-profit organizations. Clients who work with the IR Lab work in a variety of sectors, including consultancy, public affairs, and diplomacy. Social Impact Lab: The Social Impact Lab covers international projects for non-profit organizations. Students who participate in this lab will manage different social projects and work on social initiatives in developing countries. The IEU Labs are managed by IE University professors who are true experts in the different fields and industries. The key motivation for students who participate in the IEU Labs is that there is always a real client demanding good results. “IEU Labs give students a genuine taste for working as members of a consultancy team in the sector of their choice, from design to finance. Already, several Labs have made a real impact by providing solutions for clients such as the Thyssen-Bornemisza Museum in Madrid and Bank Arcano,” explains Isabel Sanchez, Director of the IEU Labs. Are you ready to participate in an IEU Lab?